Unbeatable indoor cycling motivation with out the cost. The below review pretty much sums it up ! Thank goodness for this app. Looking for cycling simulators to keep my workouts interesting. Glad I found this gem. Dropped my bike into a cycle ops mag trainer and this weekend warrior wasn't making much progress. Then attached a wahoo fitness cadence and speed sensor and ANT+ to feed Race My Ghost with data and my workouts really took off. The Race My Ghost gauges, workout range settings, and timing/progress indicators are big, clear and use colors to convey information. The road race simulation adds a new dimension and perspective to the data, great stimulus for keeping my head and body in the game. Love that I am "racing" against my slowest, best and average rides and able to compare throughout the workout. Really neat graphic concept - like how the overhead viewpoint pans in and out as you ride with the pack and then adjusts when you go out solo. 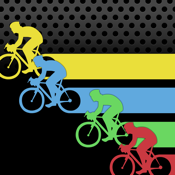 Riders and road are better representation of my effort than charts and numbers that other apps focus on. These visual elements make it real. Experienced no technical issues with the Race My Ghost app - worked great from the start. Important: This app requires the wahoofitness ANT+ adapter to recieve speed data from any ANT+ speed/cadence sensor or with devices with bluetooth 4.0 (iPhone 4S, iPad 3 and later) can collect speed data from the Wahoo BLUE SC (speed and cadence sensor) with no adapter. Compatible with the Wahoo KICKR trainer and various other ANT+/ Bluetooth power meters.